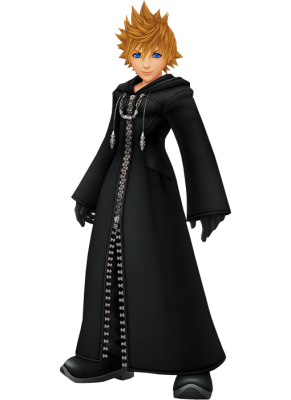 Roxas is a former member of the original Organization XIII and the nobody of Sora, created when Sora lost his heart in Hollow Bastion during the events of Kingdom Hearts. Roxas is a naive, curious individual who is best friends with fellow Organization members Axel and Xion. Due to his connection to Sora, he is able to wield the Keyblade, therefore making him extremely valuable to the Organization. He also controls the element of light as well as the Samurai nobodies. Due to the presence of Ventus’ heart sleeping within Sora’s, Roxas bears a nearly identical resemblance to Ventus rather than his somebody Sora. At the beginning of Kingdom Hearts II, Roxas was absorbed back into Sora’s body, making him whole and allowing the boy to wake from his year-long slumber following the events of Kingdom Hearts: Chain of Memories. Roxas is the main playable character in Kingdom Hearts 358/2 Days, and serves as the player character during the prologue of Kingdom Hearts II.